Electronic Arts has finally unleashed its EA Origin digital games download service for computers running Apple's Mac OS X operating system, a full 18 months after announcing plans to launch on the platform. EA Origin, which arrives on Mac OS X in public Beta initially, allows users to buy digital copies of games, which can be played cross-platform on multiple machines, with all progress and achievements being saved back to the user's account. The platform is already available for PC laptops and desktops and iOS devices like the iPhone and iPad, with games like The Sims 3, Dragon Age 2, Batman: Arkham City, and LEGO Harry Potter available from the get-go. "Origin is going to allow us to get games into the hands of our consumers as quickly as we can, to enable our gamers to connect with their friends and to enjoy their gaming experience as quickly and directly as possible," said EA Origin Vice President of Production Mike Blank. 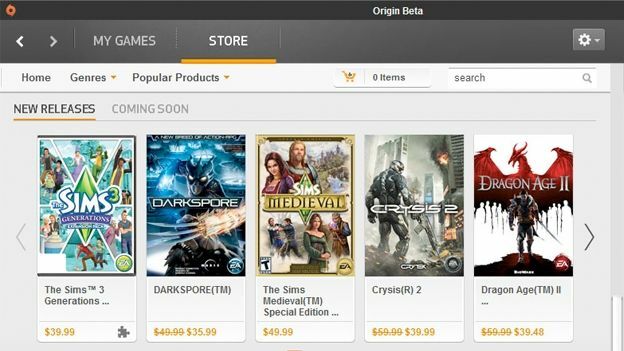 "Part of the goal of Origin is to provide real value to our gamers. With key titles from The Sims franchise and its expansion packs, if you download it once, you can download it again across both platforms." EA Origin can be downloaded free from the EA website, but you'll have to create an account to access any of the content. Users need to be running Mac OS X 10.6 and above.